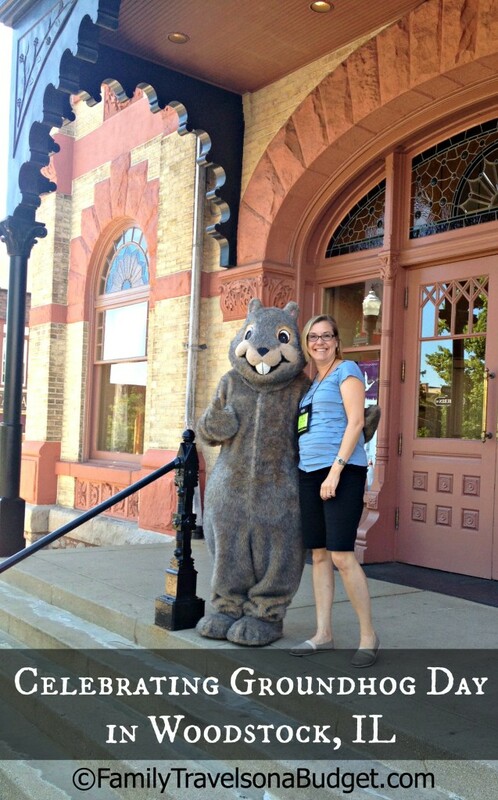 Groundhog Day in Punxsutawney, Pennsylvania is a BIG DEAL! According to tradition, the groundhog emerges from his burrow early in the morning of February 2nd to prognosticate about the end of winter. If he sees his shadow, he scurries back to his hole to hibernate for six more weeks of winter. If he doesn’t see his shadow, that means winter ends soon! Thanks, in part, to the movie Groundhog Day starring Bill Murray and Andie McDowell, Groundhog Day is more popular than ever. Did you know that the movie wasn’t filmed in Punxsutawney? Nope! To celebrate Groundhog Day Bill Murray style, head west on I-80 about 568 miles to Woodstock, Illinois where the movie was filmed. The quaint town of Woodstock celebrates Groundhog Day all week, offering free movie viewings and walking tours, special dinners and other events for the whole family. Last summer, I got to visit Woodstock and see those sites myself. This quaint midwestern town is proud of its heritage — and its place in Hollywood history! One of my favorite scenes in the whole movie is when Bill Murray (Phil) pays a piano teacher $1,000 to learn to play Sergi Rachmaninoff”s “Rhapsody on a Theme by Paginini” (eighteenth version). While not a trained pianist, Bill Murray learned to play the piece by ear for the film. Today, the house is privately owned and remains the same color it was in the movie — kind of like the movie itself. It’s always the same! While the owners never has to worry about is what color to paint the exterior of their home, they do have to endure strangers taking photos of their front door. Would you mind that? On my tour of Woodstock, the guide explained that the weather changed from day to day making it necessary to recreate certain conditions such as snow and puddles. For the puddle scene, the crew actually had to remove bricks from the roadway to make the hole large enough to step in. Hilarious! Right? While much of Woodstock remains the same today as it did in 1992 when the film was recorded, the sidewalk where the puddle scene was filmed has been widened. But never fear…. 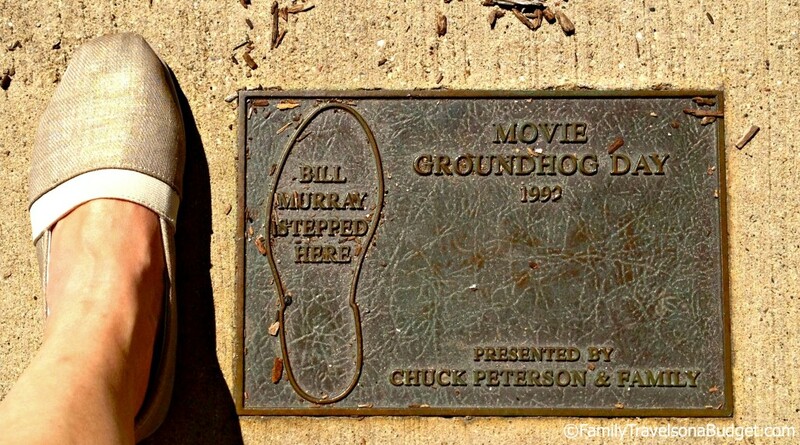 the spot where Bill Murray stepped is forever commemorated with a plaque. 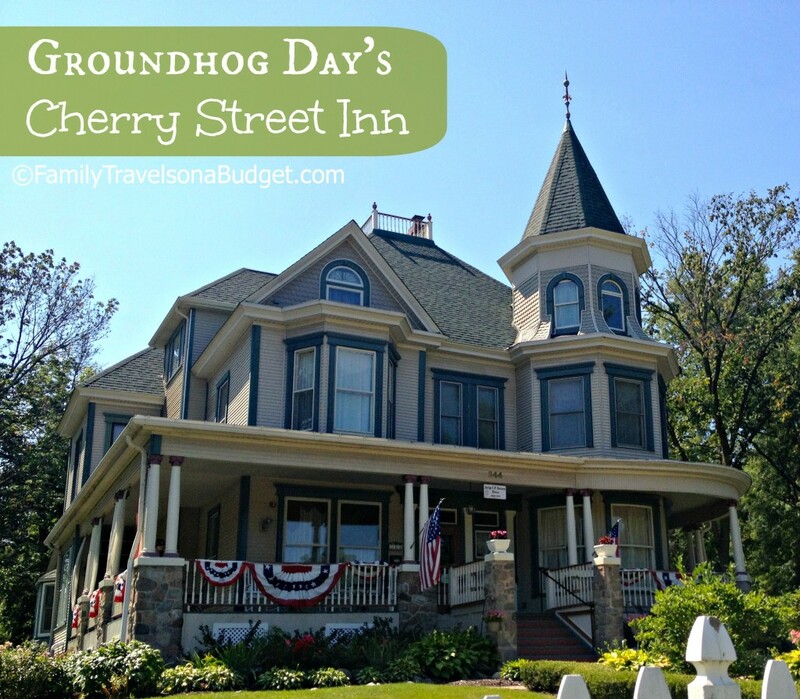 Groundhog Day fans might enjoy a stay at the Royal Victorian Manor, known as the “Cherry Street Inn” in the movie. During filming, the Inn was a private home. Only its exterior was used — and all indoor shots were filmed on a soundstage. If interested in staying here during the Groundhog Day festivities, book far in advance. Those five rooms sell out quickly. Groundhog Day is Groundhog “week” in Woodstock! The town rolls out the red carpet for movie fans from around the world. The movie plays all week long, for free, in the town theater. Family friendly events are planned throughout the week. Of course, the main event is the annual prediction at 7 a.m. on February 2nd. In the town square, Willie — Woodstock’s own groundhog — will emerge from his burrow to decide when spring will arrive. A local polka band will even be on hand to welcome him. 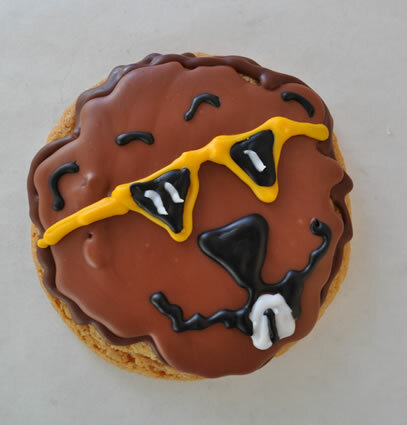 After Willie makes his prediction, head over to Jaci’s Cookies at 124 Cass Street (near the town square) for a fresh groundhog cookie in honor of the big day! 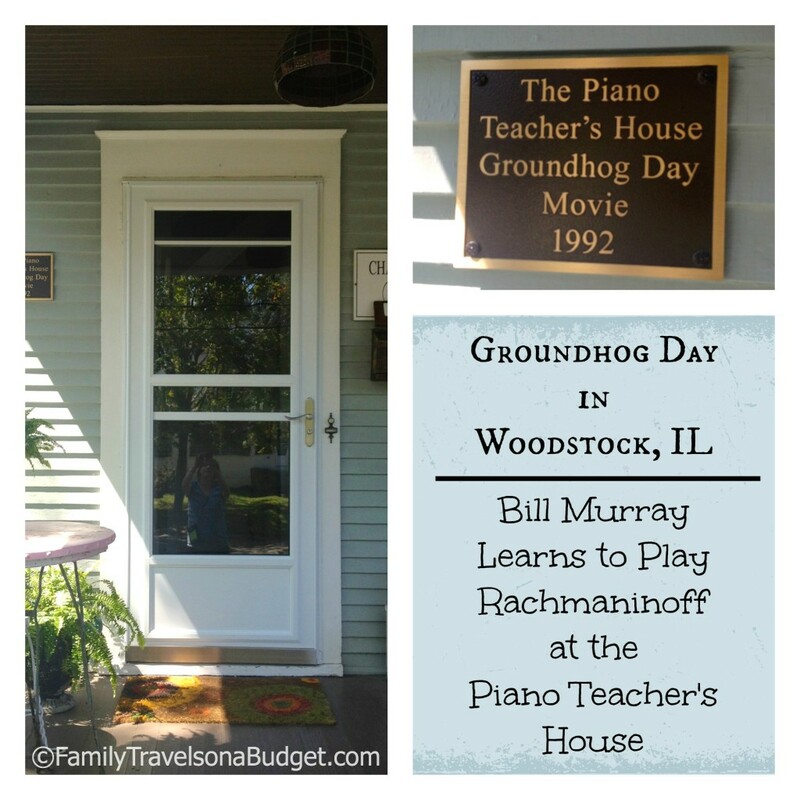 The people of Woodstock, warm and friendly midwesterners, welcome Groundhog Day fans year round. I highly recommend a visit — and a sugar cookie! Only one hour northwest of Chicago, a side trip to Woodstock would make a fun diversion from a big city vacation. What’s your favorite scene from Groundhog Day? If you ever head to Chicago, this is an easy and worthwhile sidetrip — especially for fans of the movie! As a PA girl I’m sad to admit it has been a very long time since I watched Groundhog day 🙁 I’m thinking I need to rent this and watch it with my hubby! As for the random people taking photos of my their front door…. I think that would drive me crazy lol! I know what you mean. My son had no idea why I was so excited about this post. Apparently, I haven’t been a very good mom. We plan to rectify the situation next week. I don’t think I’d like people taking photos of my house either. I even felt bad snapping a quick shot for this post…. I felt the same way in San Francisco. I don’t ever want to live in a famous house. What a fun family adventure— I’ve honestly only seen the movie once so I cannot pick out a favorite scene—but after reading this I’ve got to check it out again-I know my kids have never seen it -and I think trying our hand at those cookies would be a blast! You know, I hadn’t considered making the cookies myself. If you make some, please post a photo to our facebook page at http://facebook.com/travelingfamily. 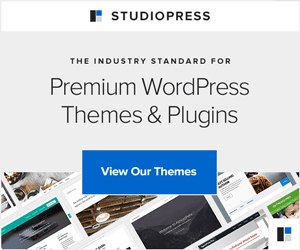 OR write a post about it and we’ll add a backlink here! HAVE FUN! I grew up in IL and never knew this existed. Great article. I used to date a guy whose birthday was groundhog day. Maria, I hope you get to visit. The town is quite charming and friendly. They also have a fabulous French restaurant right on the town square — in the summer, there’s plenty of outdoor seating. If you imagine small town Americana, this place is it. Sounds like fun. Makes me want to watch the movie again. It is such a cute movie. Would love to stay at that inn! Adam and I love bed and breakfasts. We had planned on visiting them all around Kansas, but after having Noah, we only saw 3 total(one was twice). Someday we will pick up doing that again. Did you stay at the inn while visiting? We did not stay at the Inn, but at the Embassy Suites Deerfield, North Shore. FABULOUS, I might add! Convenient to Woodstock, Chicago and everywhere else in northern IL.